The puzzle in all its penguiny glory! A tough puzzle of a map of London. Another tough one of...a bunch of cell phones and phone book pages. With no border. And extra pieces. A neat dragon we did. 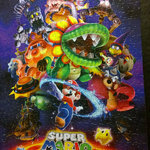 Some of the pieces were oddly-shaped, and there were even sections inside the puzzle shaped like a dragon! 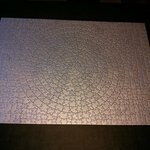 This "Starry Night" puzzle was quite challenging, since most of the pieces are swirly blue. Not helpful! 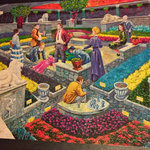 David and Miriam worked on this very difficult puzzle. Props for finishing it! 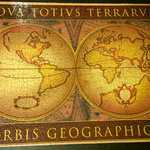 David and Miriam worked this puzzle over New Year's. Very colorful! 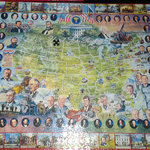 David and I then worked this cool USA puzzle - it has all the presidents and a bunch of presidential libraries and such! Sadly it was missing a piece, so we had to throw it out after we were done. This picture is all we have left of it! David and I also worked this beautiful ancient map. It was a pain - even the letters were tough because it was just a bunch of straight lines and curves. But it was worth it! David and Miriam worked this puzzle, which is one of those "mystery" ones that comes with a story. Unfortunately it was very unclear how the puzzle was supposed to help solve the mystery, even after reading the solution. 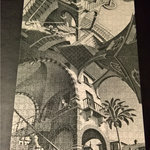 Miriam and David managed to complete this M. C. Escher puzzle, which was very tough given the large amount of gray pieces!